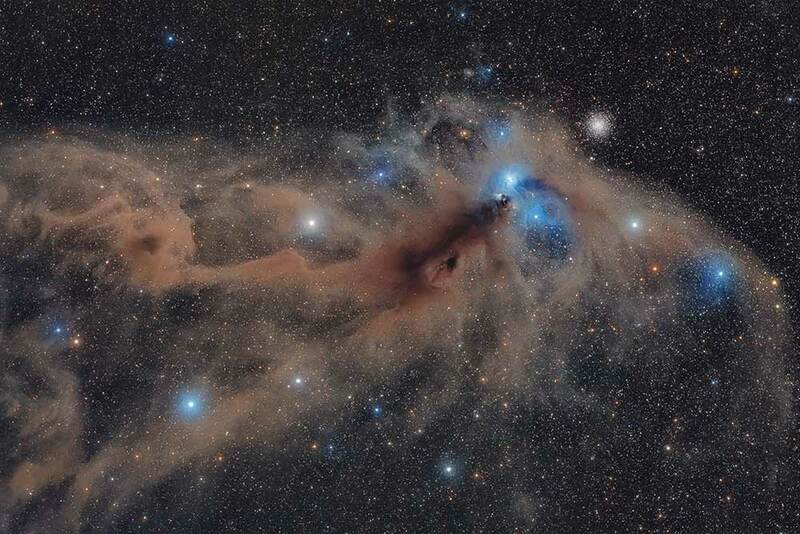 If you want to look at nice space pictures, then we’d highly recommend the Astronomy Photographer of the Year competition. 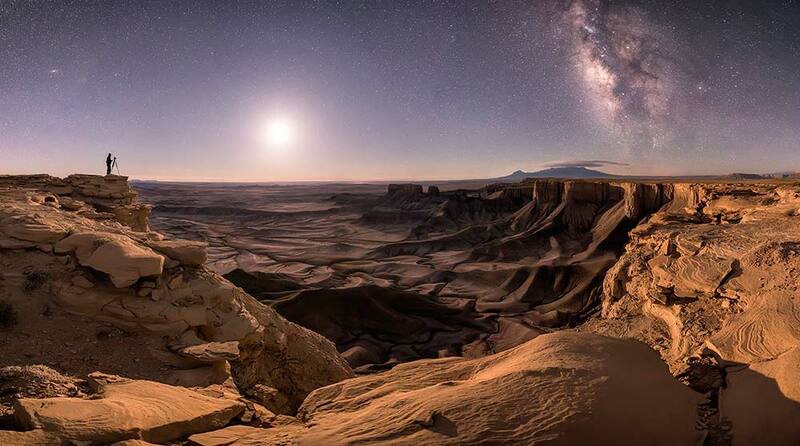 The top prize was awarded to American photographer Brad Goldpaint, whose photo “Transport the Soul” captures Moab, Utah, with a photographer, rock formations, Andromeda and the Milky Way. This year’s competition received over 4,200 entries from 91 countries around the world. Interested in adding a ‘human element’ to his photographs, once the quarter moon rose and revealed the incredible, vast landscape of the shale hills below the viewpoint, the lone photographer, to the left of the frame, stood motionless while he captured this photograph. The Andromeda Galaxy, quarter moon, Milky Way Galaxy, and position of the photographer all combined to create a captivating, harmonious portrait of a night sky photographer at work. 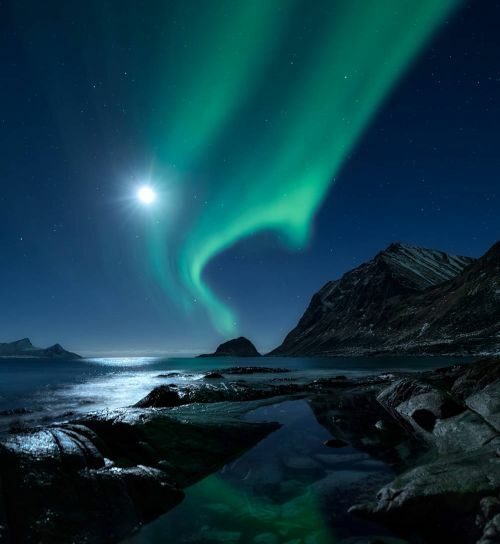 The conditions to shoot an aurora that night were not ideal because of the bright Moon but the photographer managed to capture the breathtaking Aurora Borealis above the fjord in the gorgeous Lofoten archipelago, in Northern Norway. The small pool of water with rocks made the perfect foreground and a natural leading line into the frame. 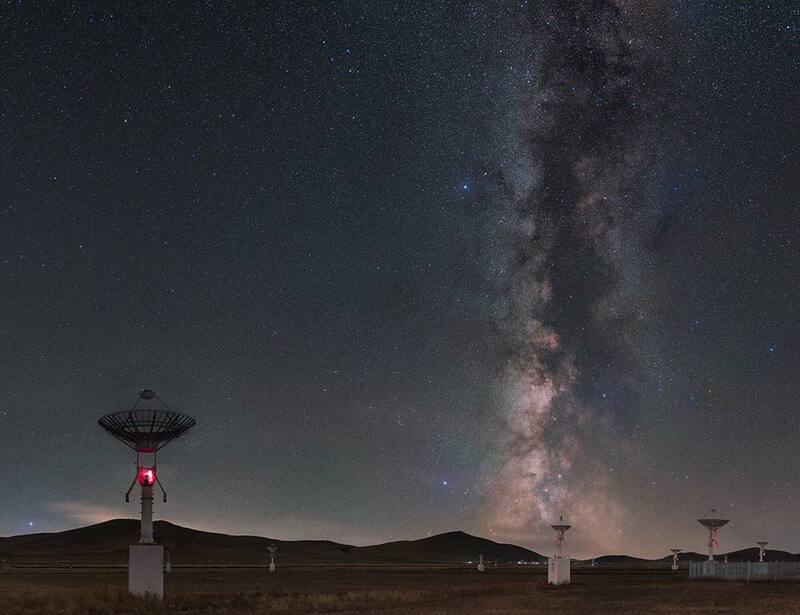 This was the last opportunity in 2017 to see the silver core of the Milky Way before it sunk below the horizon. It was accompanied by the gradual curtain call of Scorpio heralding the upward trend of Orion in the sky. Meanwhile the season of bright shooting stars quietly arrived. The image is stitched together from a total of twenty pictures. Under the dark Namibian sky, the photographer set his camera to a six-hour exposure in order to capture the CrA Molecular Complex, a large, dark and irregular area in the northern part of Corona Australis where we can see reflection nebulas NGC 6726-27-29, dark dust cloud Bernes 157, globular cluster NGC 6723 and other objects. Interestingly, there is a huge difference in distance: under 500 light years for the dust complex and 30,000 light years for the globular cluster. 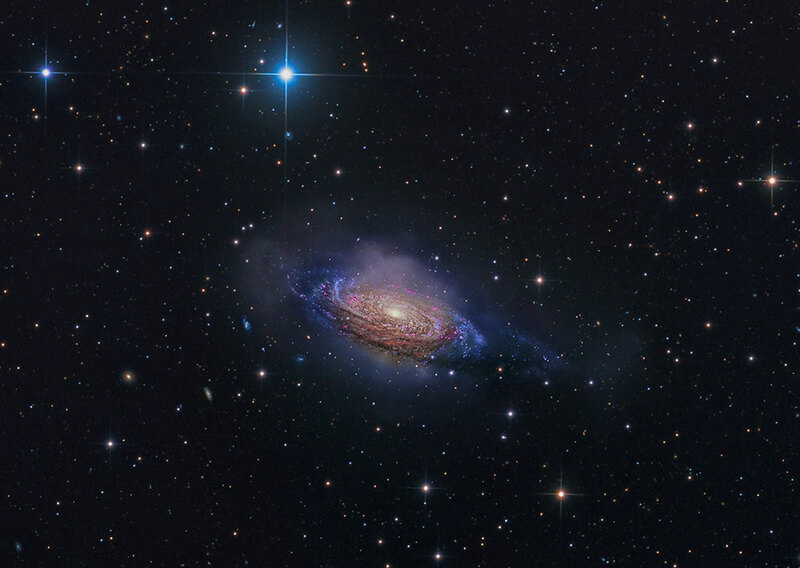 The spiral galaxy NGC 3521 is located around 26 million light-years away in the constellation Leo and presents complex scene, with enormous amounts of surrounding dust and stray stars glowing far out from its disk. Emerging from the photographer’s colour data was a bright array of contrasting colour tones, generated by aging yellow-red stars, younger burning aggressively blue-white stars, and various nebulae throughout the disk. This image comprises approximately 20.5 hours of exposure time, collecting data in various filter types. 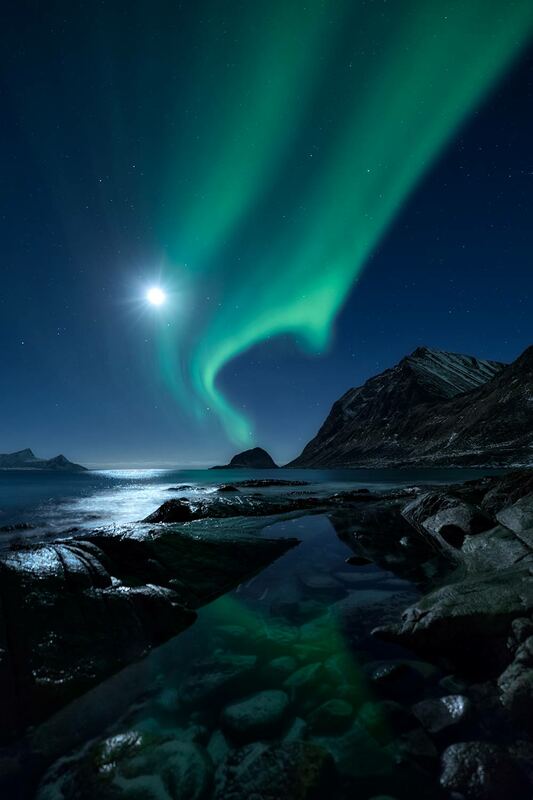 In order to capture this mesmerising image, the photographer chose the area according to weather forecasts to make sure he would get a clear sky. 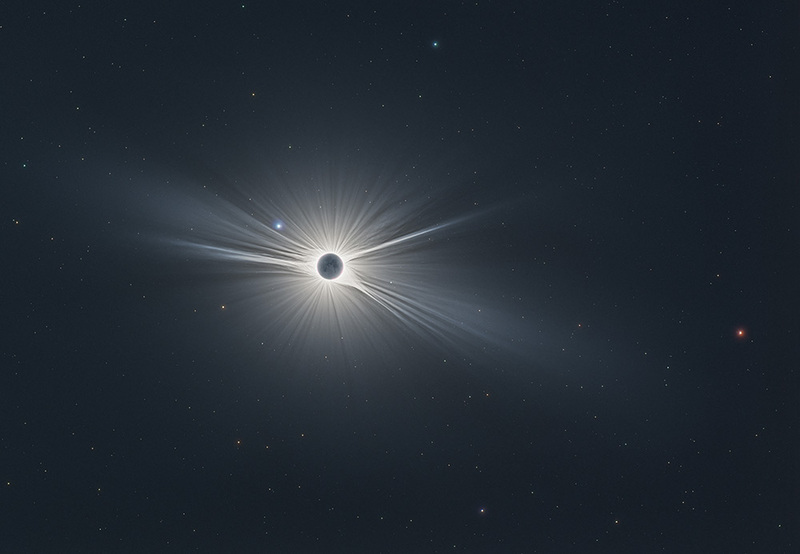 The image shows the Sun corona in all its glory during the August total solar eclipse.  It is flanked on left hand side by the blue star Regulus – the little King – and by the red planet Mars on the right. The many radial streamers of the solar Corona are a real crown for the Sun King and the corona can be traced almost to 30 solar radii distance. During a total solar eclipse the brightness of the solar corona hides details of the Moon to the human eye. 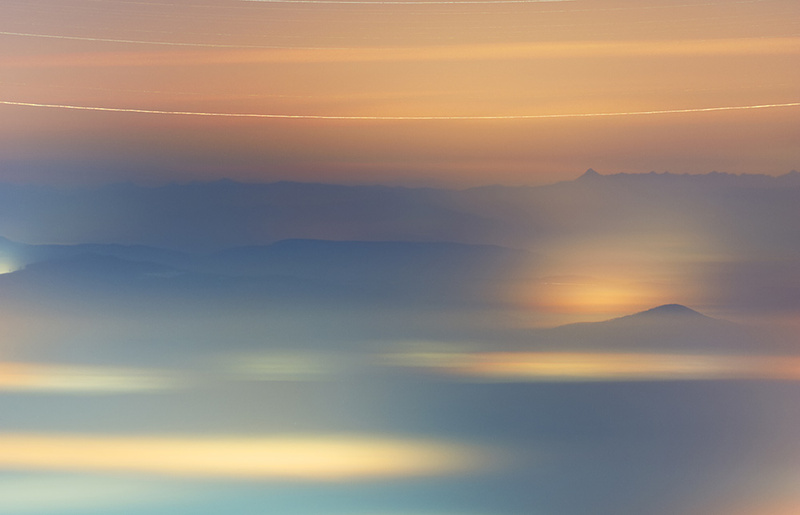 But by layering multiple digital exposures in this image from 2 seconds to 1/2000th of a second, the photographer managed to reveal much more. 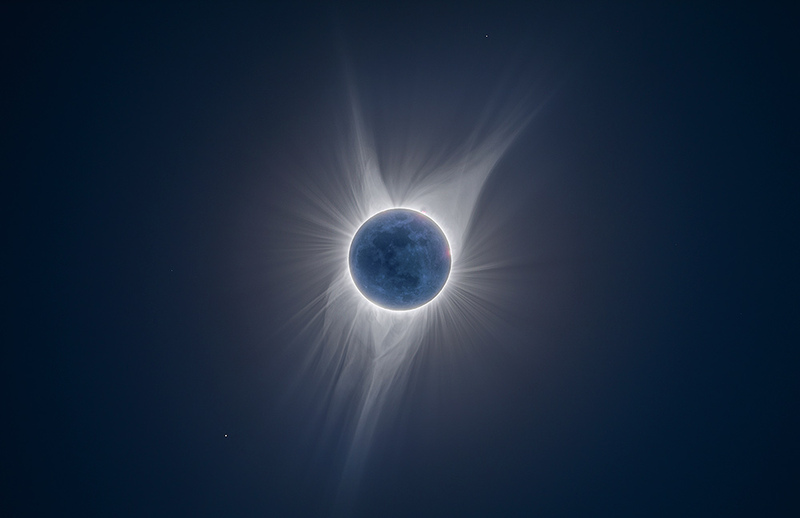 The image showcases not just the brilliant solar corona, but the newest possible of new moons, seen here illuminated by sunlight reflecting off the Earth.  This is a single-frame image and not a speculative composite. 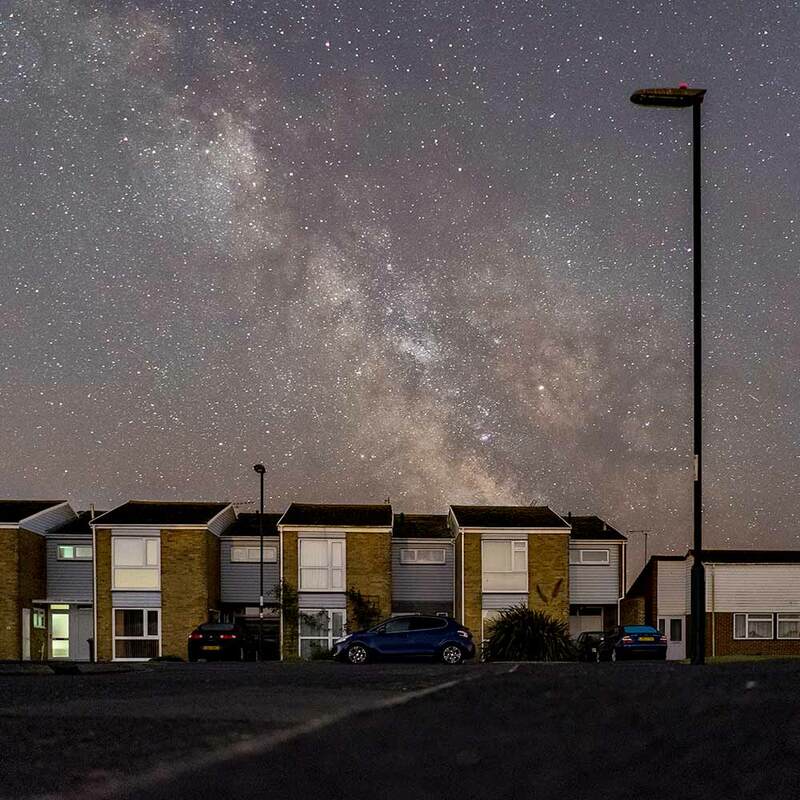 Situated on a south-coast peninsula, this street falls within a part-night street lighting zone; when the lights go out, there’s nothing to interfere with the view of the stars until continental Europe- miles across the English Channel. The scene might be perceived incongruous or surreal and almost shows how accustomed we’ve become to the loss of night sky views due to light pollution. It was a conscious decision by the photographer to feature the unlit streetlamps, hinting how it might be possible to undo the damage and restore awe-inspiring views. 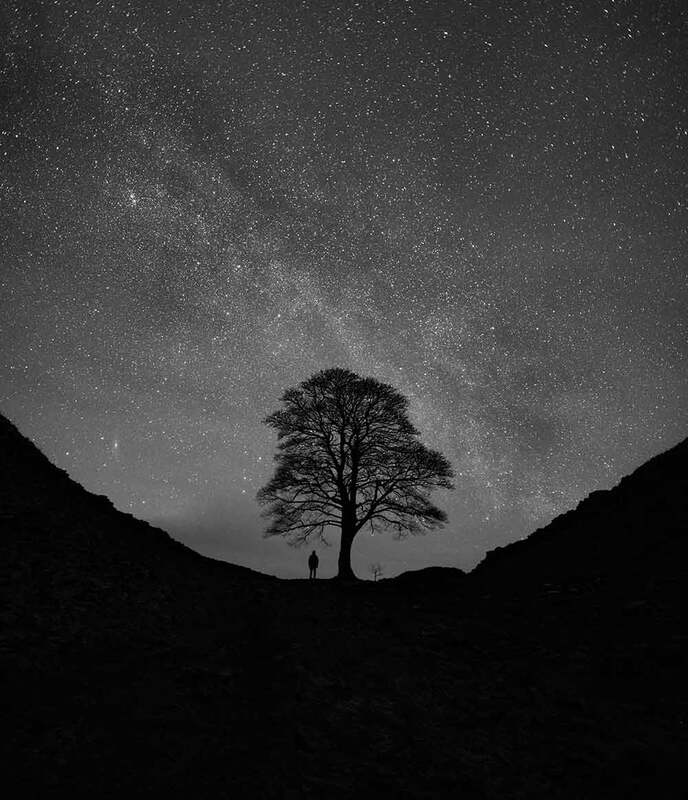 This photograph was taken just after Christmas at the Sycamore Gap, Hadrian’s Wall in Northumberland and showcases the majestic winter Milky Way and the Andromeda galaxy. The temperature was about -4°C and the photographer arrived from Lancashire at 11 am but had to wait till 2.30 am for the Moon to set and for all the stars to be visible. The cold winter weather weaves a transparent blanket above the human settlements. If one rises above this coherent surface of mist, the colourful star trails can be brought together with the glowing lights of the cities. This extremely long capture sequence took half of the winter’s nights facing the clear northern sky as the circumpolar star Almach, also known as Gamma Andromedae, just touched the horizon. 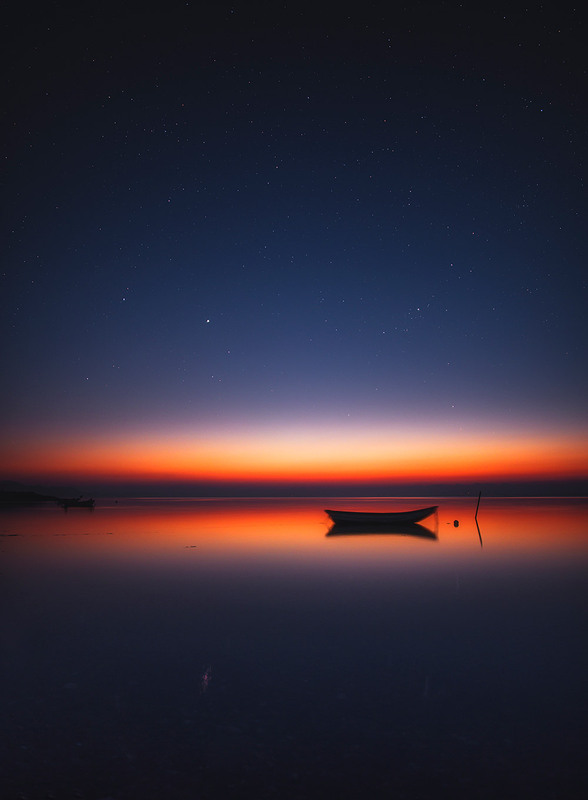 The dark summer sky in Denmark and the ideal weather on 22 May 2017 allowed the photographer to capture this magnificent orange glow over Limfjord, a beautiful place just five minutes away from where the photographer had lived for six years. The weather was so calm and quiet, which made the photographer think that time was standing still. Almost 5,900 light years away, toward the southern constellation Centaurus, lies a large beautiful nebula known as the Lambda Centauri Nebula. The intense light from stars in a young open cluster cause the surrounding gas to glow with a magenta hue from emission lines of ionised Hydrogen atoms. 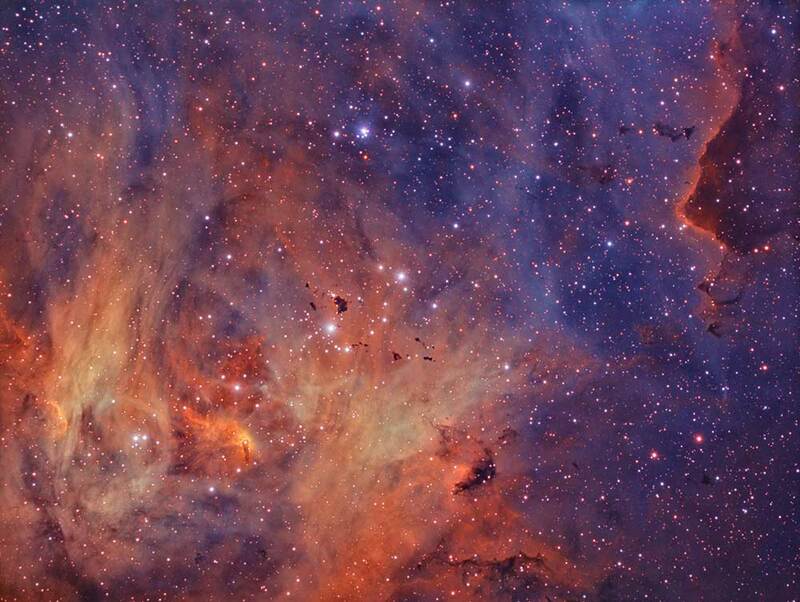 In the centre of the image, is a group of Bok globules, which are dark, dense collapsing patches of gas and dust where new stars are frequently born. These were discovered by South African astronomer, A David Thackeray, in 1950 and are now known as Thackeray’s Globules and are a favourite target for backyard astrophotographers. The largest globule is two separate clouds that overlap slightly. While they appear small in the context of the grand nebula, these overlapping globules are each 1.4 light years across and together they contain more than 15 times the mass of our Sun. These photos are completely out of this World!